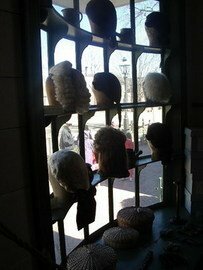 So why was the Wigmaker at historic Williamsburg our favorite part of the tour? The guy playing the "wigmaker" at Colonial Williamsburg was funny as all get out, and kept offering to buy the hair of the red-haired 8-year-old girl in front of us (apparently, red hair was highly prized back in colonial times). Wig makers, it seems, went around the world to get hair of different colors. To get red hair, they went to Ireland. Black, straight hair? China. Yellow, flaxen hair? Sweden. Now you can see why wigs were so expensive! Apparently, the trend was started by the French king Louis XIII, who was bald (I guess you could consider him the father of the toupe). You wouldn't have found a wig at ol' George Washington's house. Why? Believe it or not, he didn't use one! (Could've fooled me from his portraits.) Guess he thought they were ridiculous (gee, that makes two of us)...he just had someone style his own hair. You'll "flip" for the Wigmaker's Shop at Historic Williamsburg. Poor people couldn't afford wigs; in fact, they often made money by selling their hair to wigmakers. The middle class? If they could afford wigs, they usually bought cheaper ones made of goat hair (oooh, itchy!). Only the very wealthy could afford wigs made of human hair. One wig could cost as much as one acre of land or an oxen. For dressy occasions, the rich would powder the wigs with flour or white powder. As the evening went on, the powder would shed (all over their clothes and the floor), so they would retire to the Powder Room (get it?). 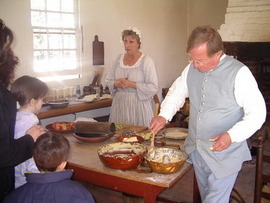 Making cornbread the old fashioned way at the Ben Powell House at Colonial Williamsburg. - Like everything they make at historic Williamsburg, it was made from scratch, using ingredients and methods used in colonial times...all the way down to the murky, doughy water we got to "wash" our hands in when we were done mixing. Yuck. Sure makes you appreciate running water! That's what it's like at historic Williamsburg: you're alternately intrigued by how things were done in colonial days, and stupefied that they got along without our modern stuff. After trying on some colonial garb, trying out their spinet (an early version of the piano) playing some colonial games, we we went outside where our kids "attempted" to play hoops. You've probably seen pictures of kids keeping big wooden hoops rolling along with a stick? Much harder than it looks, trust me. We never did figure out how to do it well. Don't miss the tour of the Capitol building, the home of the colony's House of Burgesses (the first elected body in the New World). It's excellent! Although a bit slow for our 5-year-old, as a teacher, I loved listening to little bits and pieces of juicy history. On the second floor, pay attention to the colonial maps of Virginia, which show it's original boundaries...as far north as Michigan and west all the way out to the Pacific! - Kids will LOVE the entrance hall, which has hundreds of swords on the walls. Decorative AND useful, since during the revolution they actually pulled them off the wall to go fight the British. The 30-minute tour takes you both downstairs and up, and the costumed guides share lots of historical tidbits. For example, in the long ballroom (which was a disgusting, but authentic shade of green), our guide described how people invited to balls here would dance from 6 pm until midnight, eat a high protein (meat, meat, and more meat) and sugar (desserts galore) dinner, then resume dancing until dawn. This was a real highlight of historic Williamsburg. The helpful interpreter explained the pewter-making process, all the while making spoon after spoon. If they weren't perfect, he just dipped them in the molten pewter, where they immediately melted. Fascinating. - The Newspaper Print Shop and the Book Bindery are immediately across from each other in a small courtyard behind the main street in historic Williamsburg. We prefer the Newspaper Print Shop (the interpreter was more interesting). He even explained why "s's" used to look like "f's" in colonial newspapers. The Gunsmith Shop? Skip it! - For my tip for getting in the Historic Williamsburg area for "free," read my Secrets of a Cheap Colonial Williamsburg Vacation. - For yummy but inexpensive Williamsburg restaurants, click here. For my reviews and discount ticket secrets of nearby attractions, like Busch Gardens Williamsburg, Kings Dominion, Prime Outlets Williamsburg, Great Wolf Lodge, and Jamestown, go to my Attractions page.